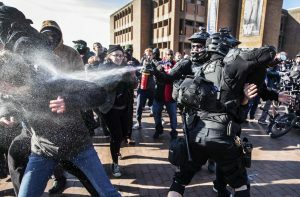 A shredded American flag, fights breaking out, the strong smell of sage overtaking Red Square and shouting across police barricades was the scene at the University of Washington campus on Saturday. “We’re here to fight back against the far right and fascism on our campus,” said one of the speakers opposing the group “Patriot Prayer” and their on-campus rally. More than a thousand people marched to the rally at Red Square opposing College Republicans who invited “Patriot Prayer,” a group based in Vancouver, Washington, to speak on campus. Sean Moore and Tyler Bykonon, both sophomores at the University of Washington and both against the presence of the group on school grounds, say it was empowering to be at the rally. “Obviously, I’m not a fan of these guys coming to our campus and making a huge statement. They’re coming out and attracting resources,” said Moore. Moore says the Patriot’s Prayer group, many of whom were wearing MAGA hats support President Trump’s agenda, which Moore says he fiercely disagrees with. “I’m not a fan of the President and these people are fans so I want to come out here and say this is not ok. And what you’re doing is not okay,” said Moore. People like Kathryn Townsend, who voted for Trump says the opposition doesn’t understand what the group is about. “I saw a lot of anger on both sides. I learned that they thought my vote was a hate crime,” said Townsend. She’s says she’s attended more than 17 rallies this past year and says Patriot Prayer is not about fascism like the opposition claims. “Let’s go out there and drown them out with a positive message. We refuse to accept a fascist America, we’re going to drown out your whole fascist regime,” said one of the speakers for the opposing side.